Congratulations to Alan Henderson and Derek Veale who have been promoted to division 7 following their excellent race at the Forth & Clyde Canal. The race on 1st June was held on the canal rather than the river Tay due to a lack of water in the river. Alan and Derek who have been training hard in recent weeks came third overall just behind division 5 paddlers Margaret Chapman and Derek Marshall in the K1 class. This has lead to them being promoted from division 8 and 9 respectively to division 7. They will no doubt be delighted that their hard work has paid off, and the club wish them luck in div 7. The first of two summer training camps to be held at Kinghorn Loch finished today. 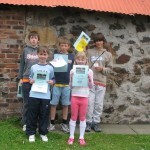 The camps were run by Scottish Development Coach Kristina Medovcikova, and were aimed at 8-13 year old boys and girls. The camps were held over 2 hours each day from Monday to Friday. Paddlers were introduced to paddling and under the expert tuition by Kristina quickly learned to paddle a kayak. They developed their skills each day learning to paddle forwards, backwards, and sideways! All the paddlers were developing well by the end of the camps on Friday, and several impressed with their natural ability. At the end of the week each paddler received a certificate on completion of the camp, and gained their Level 1 PaddlePower certificate. 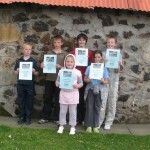 The photographs below show the two groups of paddlers who completed the camps this week. There are two further camps which will be held the week commencing 21st July. Further details and booking information is available here. Paula Henderson returned from the British Sprint Championships held at the National Watersports Centre, Nottingham, as the Girls K4 500m British Champion. Paula paddled with Scottish Development Squad (SDS) compatriot Rhonwen Smith of Linlithgow and two other paddlers from Basingstoke. The photograph shows the two paddlers during the medal ceremony. The K4 crew also enjoyed success in the K4 1000m race taking silver. Paula paddled with regular K2 partner Rhonwen to take bronze in the K2 500m race. Both paddlers also had good results in their K1 events over 200m, 500m, and 1000m. Colin McMorrin also competed in the Mens B competition, over 1000m, 500m, and 200m. He also teamed up with a paddler from Falcon canoe club for the K2 1000m race. Conditions were difficult at times over the weekend with strong headwinds and rain. However a very successful trip was had by all, making the journey south very worth while.